La Rochelle, Chef de baie / airport, as well as all the ports of Île de Ré. 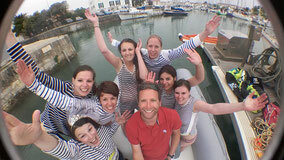 SWIM, ENJOY and Discover Beaches, restaurants of Ré and La Rochelle with Boat Event. DISCOVER NAVIGATION, Enjoy the BOAT VISIT the most beautiful landscapes, sites for all your occasions. Boat Event allows you to move by sea, forgetting your car and all the inconveniences you may encounter during the summer season. Boat Event is a time saver for any activities you want to perform and has only benefits. Want to arrive on time at the restaurant? Thanks to us, you will no longer know the traffic jams. 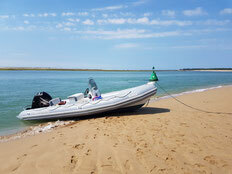 You do not know the coast of Ile de Ré and its villages? Let yourself be carried away, and discover the most beautiful places, and beaches accessible only by sea. An original journey is offered to you to spend a moment that will remain unforgettable. 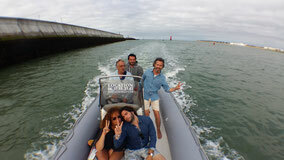 Boat Event offers many tailor-made services. To offer you all these shuttles, Boat Event benefits from two bases of departure.